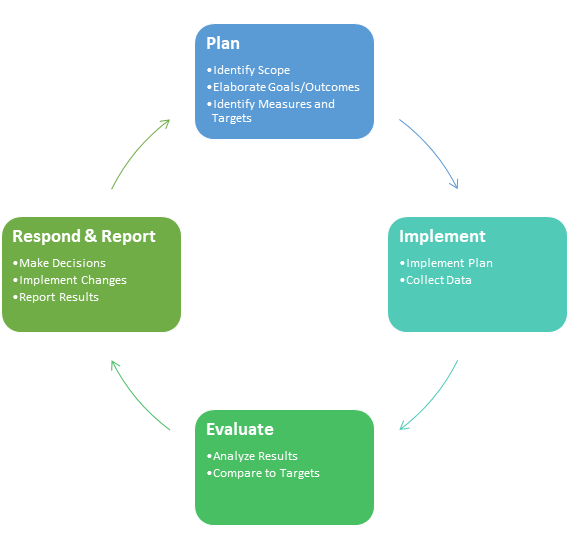 Assessment is a term that has multiple meanings in educational contexts, but for the institutional effectiveness function it refers to a process that includes planning goals/outcomes, implementing measures of performance, evaluating the resulting data, and implementing actions for improvement. The guiding values for IE’s approach to assessment is expressed in the motto “Missional, Meaningful, Manageable”. Missional- Reflects the value of our shared purpose as units in a larger institution and our alignment around common strategies for achieving our mission. Meaningful- Represents the importance of collecting data can inform decisions for improving the quality of services our university provides. Manageable- Recognizes that in order for assessment and improvement efforts to be sustainable, they must be embedded in our organizational practices and not burdensome. Academic Programs: focused on learning outcomes assessment. Administrative Units: focused on alignment with institutional goals and budgets. General Education: focused on general education outcomes in programs and core classes. Student/Academic Services: focused on a combination of student learning and operations.